Description: This was one slow intermodal! Notice how the switch is aligned Can you find Glenn in this picture? Description: Both locomotives are now at an angle to the train as they pass over the switches. Description: I just love this shot. I only wish it could have been sunny! Description: Which flares do like better? EMD, or GE? Description: A "naked horse" leads the 227 double stacks west. Description: NS C40-9W 9921 in its stealthy gray primer. Notice the stenciled lettering on the cab. 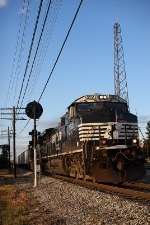 Title: NS 11R NS 9921 Sunbury Pa. Description: I think this was a 200 series Intermodal train. Description: 18th Ave., 0745 hours. Description: Eastbound on track one with an ex-Con trailing as they enter Enola Yard. Description: 309 westbound at Temple Rd.